Click here to download the first two chapters of the book in .pdf format! Japan in the late sixteenth century was a land in turmoil. Lords of the great clans constantly vied for position, generating countless tales of scheming and intrigue. Bound by a rigid code of honour, the aristocratic samurai were left to execute their lords' designs whatever the cost. Death defined these warriors' very existence; they could be commanded to die by their lord at any time to prove their loyalty and strength of spirit. A dishonourable end would bring shame upon an entire family - for generations to come. The man would come to be known as Musashi Miyamoto however was almost diametrically opposed to this stance. He spent most of his life wandering Japan without a lord, searching for enlightenment and honing his legendary sword skills. His collection of writings on strategy and bearing in life, The Book of Five Rings, illustrated his thoughts quite succinctly: though he was unafraid of death, he did not long for it; rather, he yearned to be a master of all things by and for himself. But at the age of thirteen, the highborn yet lonely teenager, whose given name is Bennosuke, finds himself deeply disconnected from he rest of his village. His mother died when he was a young boy, and his samurai father, Munisai, has abandoned his son in service to his lord, Shinmen. Bennosuke has been raised by his uncle Dorinbo, a monk of Shinto who urges the boy to forgo the violence of war and embrace the contemplative life. Instead, Bennosuke worships his absent father, who has become a loyal commander in Lord Shinmen's army. Munisai had channeled his long-held anger, guilt and grief into strength on the battlefield - a trait that has helped him ascend the ranks - but shifting alliances outside of his control have left the fearsome warrior indebted to the odious Nakata clan. The escalating consequences of this feud are profound, forcing Bennosuke to confront harsh truths about his family history and his own place within it. Now he must walk the samurai's path - awash with blood, bravery and vengeance - embarking on a journey that will culminate in the epochal battle of Sekigahara, where Bennosuke will proclaim his name as Musashi Miyamoto for the first time. 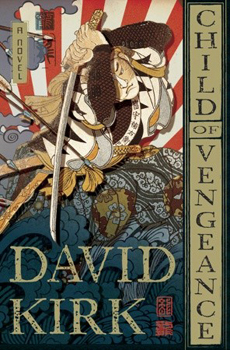 "This historical debut rips along at the speed of a deftly wielded, flashing katana sword....Well anchored in history, beliefs, and traditions of feudal Japan, this novel is a personal psychological trip...educational, engrossing, and just plain fun-to-read....should appeal to a wide variety of readers, especially those who loved James Clavell's Shogun." "A brilliant piece of historical fiction --- loaded with treachery and betrayal --- that pulses with life. This one is going to find an honored place on many a keeper shelf. It's a must read debut from an exciting new voice." "A fascinating, exciting book, beautifully observed. Kirk avoids clichés at every turn, and creates characters of great depth. An absolute gem." 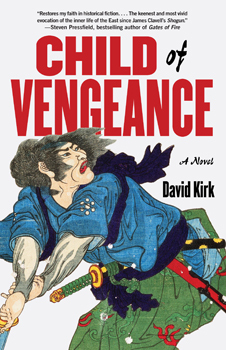 "Kirk proves himself a worthy samurai novelist with this brutal account of real-life 17th-century swordsman Musashi Miyamoto… Kirk, who lives in Japan, positively seethes with energy when depicting bloody violence—from great battlefields to intimate ritual suicide—showing feudal Japan as a complex culture in which cunning and poetry are indispensable, and death and vengeance unavoidable." "This is the book I've been waiting for! Razor sharp samurai action coupled with a brutally realistic vision of life in sixteenth-century Japan, a real find." The original title was The Children of Amaterasu. The next title was The Sanctity of Vengeance. There is a lot of historical nonsense in the book, but it is well meaning nonsense. Foremost perhaps is the character of Dorinbo. He is portrayed as a monk of Shinto, whereas in reality he was Buddhist... and I'm not even sure monks of Shinto exist. However, as Musashi gets heavily into Buddhism later in his life I wanted to discuss Shinto when I had the chance, so Dorinbo had his faith changed arbitrarily. Such is the power of the author. The UK edition contained a historical note explaining a bit more in detail the fact/fiction division of the novel. The US edition was lacking this - though I believe it got recycled into various promotional materials - so for the sake of curious American readers, you can find it here.